Terracotta Tile: What You Need to Know – Mees Distributors, Inc.
Are you planning to apply your tax return to a little home improvement this year? 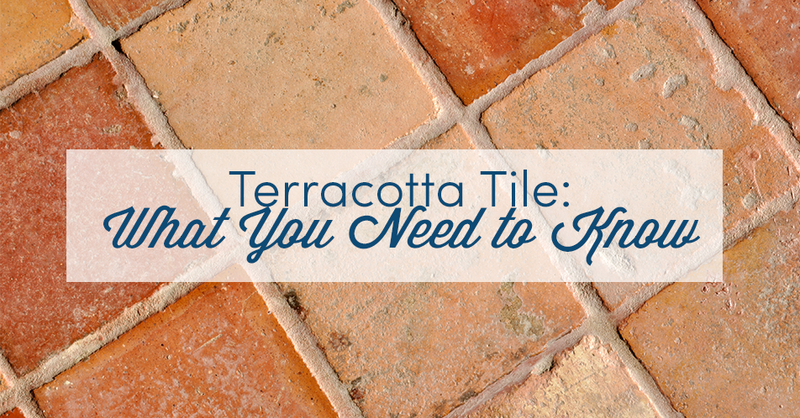 If your plans include tile, you might consider the benefits of terracotta. Tile as iconic as terracotta creates an old-world ambiance anywhere in your home. From Spanish hacienda and Southwestern designs to Old Italian country villa styles, terracotta offers rustic elegance to any room. The rusty red coloring of the clay used in terracotta ceramics lends a warm, earthy tone, welcoming and easily blended with nearly any other color scheme. Producers make terracotta tiles usually in one of four styles. Which would work best for your remodel? Unglazed terracotta retains its natural finish fresh out of the clay-baking kiln. Like any ceramic with no coating, the porous surface of the tile will absorb liquids and oils spilled on the floor, counter or backsplash. Although water itself will dry, other spills will leave permanent stains. Also, the sand of the clay can wear away over time if walked on without an applied sacrificial finish. An application of matte finish wax or chemical sealant can allow much of the appearance of natural terracotta to remain while offering some level of protection. A factory glaze, either clear, colored or a combination will protect the tiles from spills and wear. The glaze gives it a bright, shiny finish from which to clean up any accidents and that reflects light back into the room. If a polished floor is your preference anyway, glazed terracotta could be your tile of choice. When it comes to the art of tile making, machines haven’t completely taken over the world. From mixing the clay, forming it into a variety of shapes, setting it out in the sun to dry and feeding it into kilns, many artisans still create terracotta tile by hand. Although considerably more expensive, each tile is unique in its completed state. Handmade tiles with elegant designs work perfectly for backsplashes. The popularity of terracotta calls for more efficient production methods in order to be widely available and affordable. So, most modern terracotta is mass produced. These products have the uniformity that makes for even floors, walls, counters and ground pavers. Still attractive, though, machine cut tile works well, especially when the high price tag for hand-crafted tile defeats your decorating plan. Let Mees Distributors, Inc. show you what you can do with terracotta in your home. As a full-service ceramic tile and stone distributor, we have access to factories and artisans across the globe. We can special order terracotta if you prefer a style we don’t normally stock. Also, you may like to work with our design specialists to learn everything you need to know before installing terracotta tile in your home. For more information on selecting, installing and caring for ceramic and stone, please see our other blog articles. Stop in today and see what Mees has to offer!